Ask About Adding OLife Choice, a Limited Time Package on 2019 Nautica Departures. Ask about adding OLife Choice, a limited time package including your choice of Shore Excursions, Shipboard Credit or Beverage Package. *Restrictions apply. 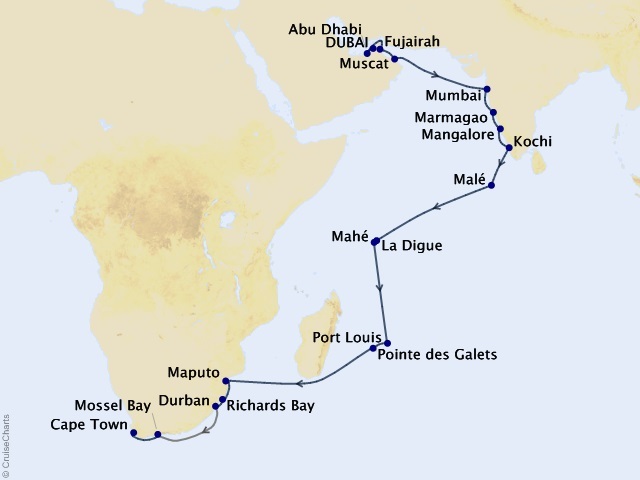 Promotions vary by sailing and not all of the above mentioned promotions apply on every sailing. OLife inclusions are not combinable with the fares in Pricing and Staterooms tab. Offers are subject to availability, capacity controlled and may be withdrawn at any time. Abu Dhabi is one of the most modern cities in the world. It is the center of government and business life in the UAE. The architecture of its modern buildings and sky scrapers is the finest in the Middle East. The promotion of tourism and various tourism related projects will elevate Abu Dhabi to a Singaporean status in the region. Large gardens and parks, green boulevards lining all the streets and roads, sophisticated high-rise buildings, state-of-the-art communication services and transport, the presence of all the international luxury hotel chains, rich shopping malls, cultural centers and events provide tourists a one-of-a-kind experience all the year round. Fujairah, with a stunning setting of wide sandy beaches set against a backdrop of the rugged Haijar mountains, is an emirate of contrasts, attracting slowly a growing number of visitors, especially those in search of a different kind of “sun, sea and sand” vacation. Careful planning ensures preservation and protection of the town’s rich cultural heritage and natural beauty. Despite several new luxury hotels and resorts along the picturesque coastline, the charm and tranquility, which characterized the town in times gone by, remain largely unchanged. In addition to ancient fortresses perched on rocky hilltops, there are date palm groves that grow to the sea’s edge, abundant marine life and beautiful beaches that invite exploration. This old Portuguese colonial capital of Goa was reputed to rival Lisbon in magnificence and opulence in centuries past. Mangalore is located in India's Karnataka region, strategically situated in a hilly area between the Western Ghats and the shores of the Arabian Sea. Visitors to Mangalore learn about India's ancient caste system, which is still very much intact. The people are also extremely spiritual, as evident in their many temples and religious traditions. Mangalore contains remnants of Tippu Sultan's naval fort. La Digue is a delightful island oozing with refreshing old world charm. Transportation by bicycles and ox-carts preserves peace and tranquility. For nature lovers, the gigantic granite boulders or the near extinct Black Paradise Flycatcher is reason enough to explore this fascinating island. Mahé, being the largest of the Seychelles islands, beckons with Creole restaurants, craft shops and art galleries. The nearby waters surrounding Mahé are perfect for swimming, body surfing and snorkeling. Maputo, the capital of Mozambique, is quite a place to visit. It is an important port city, and Mozambique's largest city. It is known as the City of Acacias, due to the many beautiful acacia trees found along its avenues. Visit Maputo and Mozambique for the beaches, historical sites, Portuguese colonial architecture and colourful local culture. This busy port presents two contrasting aspects of Kwazulu-Natal's exciting wildlife heritage.The coastal St. Lucia Game Reserve is a fascinating wetland reserve with some of the world's highest forested dunes - and game including black rhino and South Africa's largest hippo and crocodile populations, as well as flamingo and other exotic birdlife. Inland extends the huge Hluhluwe Game Reserve which supports Africa's greatest concentration of white and black rhino - as well as lion and elephant. Beautiful Mossel Bay is a coastal village and harbor of the World Famous Garden Route. This popular holiday town is blessed with mild climate year round and its status as historical capital of the Garden Route. Today, mussels, which give the harbor its name, are gathered in Mossel Bay each spring and are rated among the finest in the world. Due to its rich history, there are many museums housed in historical buildings to visit for maritime and sailing, fresh specimens of wild flowers, shells, and history. There are others, such as the Shirley Buildings, the Munrohoek Cottages and many others which may be visited. One of the most popular attractions is the Post Office, a National Monument estimated to be more than 800 years old. Mossel Bay is sportsman's and waters sport enthusiast's paradise. Water sports available include shark cage diving, ship wreck diving, snorkeling, power boating and others. Fares are per person, based on double occupancy and reflect all savings. 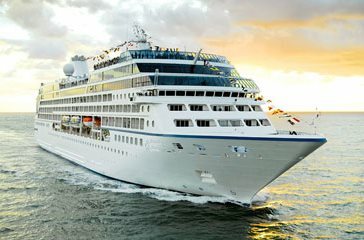 Cruise-related government fees and taxes are included. Cruise Only Fares are in U.S. dollars, per person and based on double occupancy. All fares and offers are subject to availability, may not be combinable with other offers, are capacity controlled and may be withdrawn at any time without prior notice.